LAKE TAHOE IS ONE OF THOSE PLACES THAT ONLY SEEMSto exist in one’s most Zen imaginations, but it is a very real part of California’s natural legacy. Surrounded by miles of forests and dotted with quaint towns with names like Fallen Leaf, Mystic and Truckee, the Tahoe area has drawn converts for centuries. 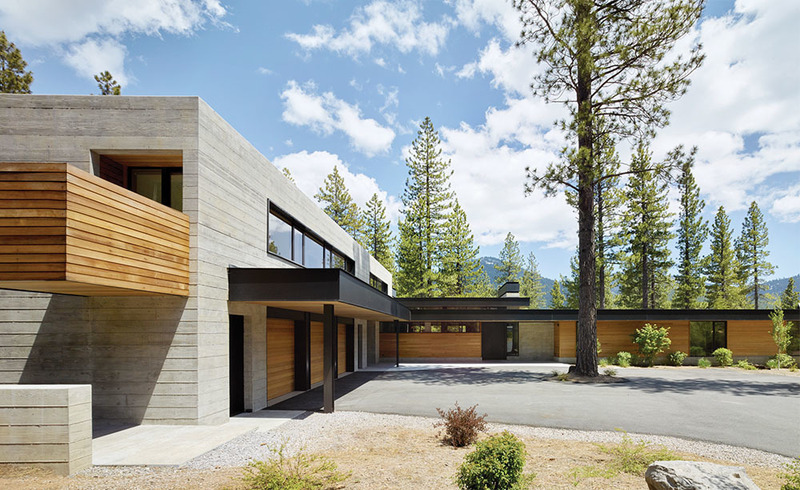 It is here, on just over an acre of wooded land in the enclave of Martis Camp, that a couple asked Zak Architecture and designer Kelly Hohla to create a modern home for an active young family that would integrate into the landscape. Having worked with the clients on a their home in Marin—another Golden State Shangri-la—Hohla was well versed in their functional and aesthetic needs. She and project manager Celeste Barnes-Bremer entered the process when it was just a series of board-formed concrete walls—the basic infrastructure set by the architectural team, led by Shay Zak, Daniel Jackson and Gary Head. "The idea was to use concrete as a dominant structural element and to define the main public spaces," explains Jackson. "The concrete was a reference to the granite outcroppings that occur throughout the Sierras. The steel columns were left unclad in order to express a rawness—a reference to the simplicity of the trees that we tried to preserve." The house, which draws more upon modernist principles than Zak Architecture’s previous designs, is made up of concrete, steel, glass and Western Red Cedar. "The palette of materials was intentionally limited," Jackson says. "This allows for the client’s art collection to stand out from the architecture." In addition, he says, "The indoor-outdoor flow is achieved by allowing the roof planes and the floor planes to slide across the site. This allows for exterior spaces to feel like they are part of the indoors." Inside, Hohla worked closely with the client on prioritizing how their art would interact with the interiors. She and the clients went on buying trips to San Francisco galleries, and worked with Lisa Lindenbaum of Lindenbaum Art Advisory to bring in some pieces. A Charles Arnoldi painting sets the tone in the open living room, its orange strokes contrasting beautifully with the muted palette. Less dominant pieces, such as those in the bedrooms, reference the environs—Raindrops, a sculpture by Curtis Jere, Horse of Late Summer by Kim Frohsin, and Mist on the Lake by Hans Op De Beeck. "WE DIDN’T WANT THE HOUSE TO FEEL TOO FORMAL," SAYS HOHLA. "It has a grand feeling because of the size of the house and scale of some of the rooms, but the goal was to create warmth, leave space, and find a perfect balance between comfort and customization. We wanted the views to come first, then the materials, and then you start noticing all of the little details." Those details include the subtle sweep of the legs on the Harvey Probber lead dining chairs, the faint striation of the turquoise Phillip Jeffries Bermuda Hemp wallcovering in a guest room, and sublime tailored fabrics from the likes of Holland & Sherry and Holly Hunt. The home’s private entrance facade gives way to large glass walls that open up to the landscape and views on the rear facade. Its layout is low and wide, with deep roof overhangs that extend past the glass walls and add a sense of continuity with the outside. To strike the perfect balance, adds Jackson, "We made significant use of sliding glass doors to maximize openings between concrete volumes, and we created a meandering path through the house with opportunities to pause and view the landscape, and areas to escape to and relax." This article was originally published in Interiors Magazine.